Spring/summer garden themed quilted throw, approx. 48x60 inches. 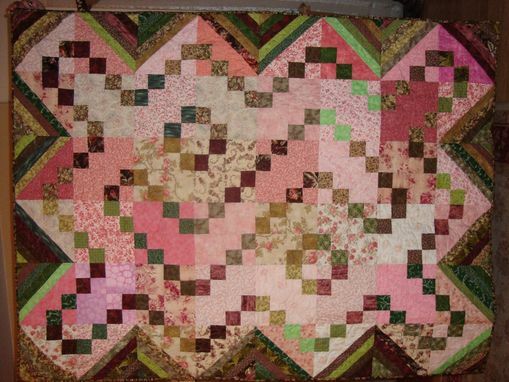 Original design using traditional quilt blocks set on point . Shade of pink are mixed with pink floral fabrics, with a "wall" of green and brown stripes as a border. 10% cotton fabrics, batting and thread. Machine quilted and hand-finished double binding for strength. Can be made in infinite colors and quilt blocks. Just tell me your color scheme and style and I can make a quilt to match!